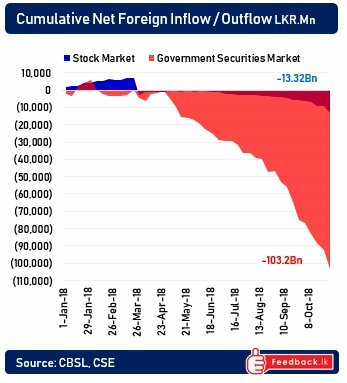 November 4, 2018 (LBO) – In the first full week of Sri Lanka’s constitutional crisis, foreign investors in Sri Lanka’s capital markets ran for the exits with nearly US$100mn leaving the stock/bond markets during the past week. For the year 2018, the total net foreign outflow from Sri Lanka’s stock and bond markets totals Rs117bn. This is close to US$660mn at todays exchange rates, however, the actual dollar outflow its higher with figures distorted due to the recent drop in the Sri Lanka rupee which sits near an all time low of Rs175/dollar. Sri Lanka’s constitutional crisis has come at a terrible time for the Sri Lankan markets, with outflows globally from emerging markets and Sri Lanka sovereign bond maturities coming up.